New facilities for the local community and congregation are being used for the first time at Coleshill Parish Church as phase one of a £1.05 million remodelling and restoration project is completed. The large Grade I listed parish church is an active focal point for community life in the North Warwickshire town, but the church’s capacity to grow its community engagement work has long been constrained by its lack of basic modern facilities. Craigmyle consultant Joel Burden has been working with the Parochial Church Council and a volunteer team at Coleshill for the past couple of years to develop and lead an effective fundraising campaign aimed at enabling ambitious plans to be carried out on a phased basis. 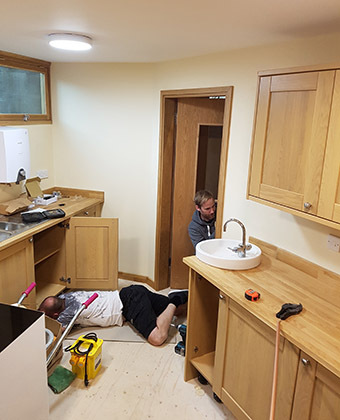 The first phase of work has seen the installation of a disabled user toilet with baby changing facilities, the installation of conservation compliant ‘pod’ kitchen facilities, the complete refurbishment of the church’s only existing private room space in the upper area of the tower, and the creation of dedicated disabled badge holder parking bays within the churchyard. An important aspect of the plans is to harness the opportunity created by the remodelling project also to address a series of heritage conservation issues within the church, including the need to reverse some decisions taken in the past that no longer meet with modern conservation standards. Accordingly, the works in the tower have included the removal of an unsightly ceiling which obscured the splendid west window, a number of important Victorian glazed windows have been cleaned, and the removal of carpeting in the chancel has created an opportunity to uncover and conserve a quite magnificent Victorian tiled floor inset with medieval floor brasses. Funding for the phase one works has been raised from a combination of local individual and corporate giving, grants from charitable trusts and support from local statutory bodies. Fundraising for the second phase of works – which will focus primarily on urgent repairs and heritage conservation issues – is now highly advanced and subject to final confirmation of an award from the Heritage Lottery Fund it is planned for phase two work to commence on site in late autumn 2018.